Col. Paul Marnon, United States Army, has 28 years of continuous military service. Over this period of time, he has been deployed on 7 combat missions. He is an experienced pilot with 5,100 rotary wing and 222 fixed wing flight hours. 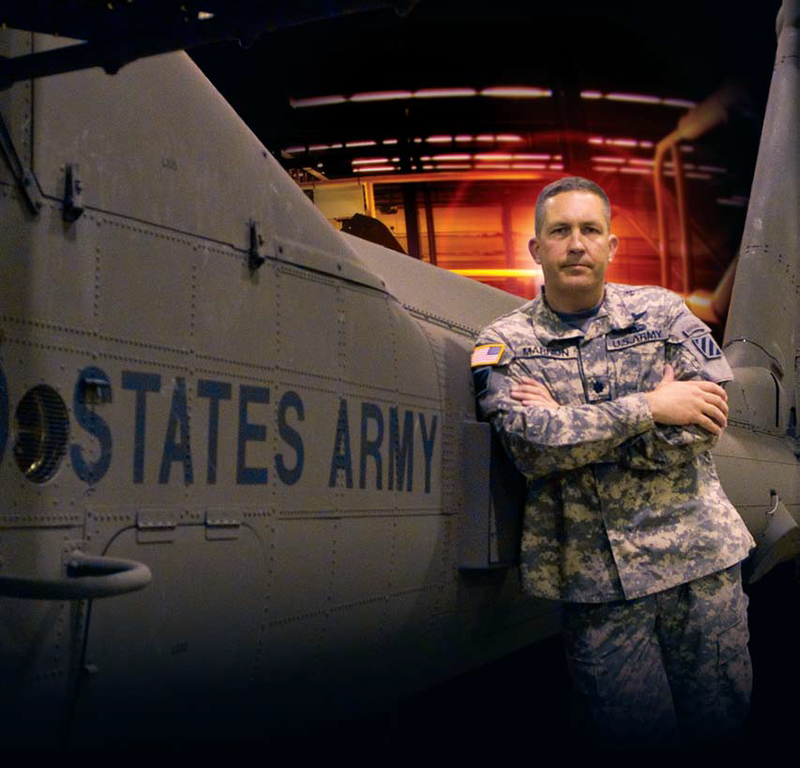 Over 3,000 flight hours were obtained during attack helicopter missions flying in extremely hazardous combat conditions. Colonel Marnon is a Master Army Aviator and Pilot-in-Command in the AH-64D Longbow Apache and is also rated in the AH-1 Cobra, UH-1H Huey, and the OH-58 Kiowa. Deputy Division Commander: responsible for staff management, leadership development, and effective utilization of over 400 Senior Army staff. Director of Plans and Operations: Responsible for operation and strategic plans & policy for 790 helicopters and 200 UAVs in Afghanistan. Deputy Commander: Responsible for synchronizing all training resources to support pre-deployment Mission Rehearsal Exercises for 60,000-80,000 soldiers annually. Managed and supervised 600 senior Army trainers, all necessary equipment, and funding to execute this training effort. Colonel Marnon graduated from North Georgia College with a Bachelor of Business Administration degree in 1987. This same year, he was commissioned as a Aviation Officer. In 1992, he attended the Infantry Officer Advance course, followed by Ranger School. He holds two Masters Degrees; one in Procurement and Acquisition and another in National Security Strategy. He is a resident graduate of the Army Command and General Staff College and the Navy War College. He has received numerous awards and decorations during his military career. A portion of these include: Legion of Merit, Bronze Star, Defense Meritorious Service Medal, Army Meritorious Service Medal, Army Air Medal, and the Army Commendation Medal.